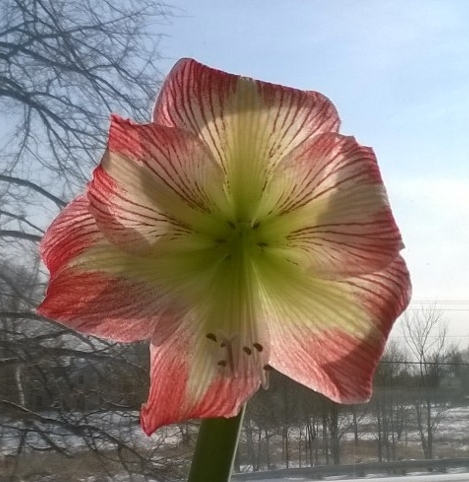 A miracle: 9 stunning flowers from one amaryllis bulb. Life is full of miracles, but we so seldom see them. Especially when daily details discourage us, dragging our eyes downward, or pain stuns us, blinding us to blessings. Yes, it is so easy to focus on everything but the good gifts God gives us, on the irritating, the mundane, the horrifying, or even the merely boring. And often these things do require our focus; we do, after all, live in this broken world. However, in order to ‘rejoice always, pray constantly, give thanks in all circumstances’ (1 Thess. 5:16-18a) we need to consciously direct our minds elsewhere, to Christ our Savior. Set your minds on such things, no matter what. Obey the Bible and make the effort to see these kinds of things. They are miracles, each one of them, in this broken world. Notice them, appreciate them, give thanks for them, rejoice in them. May God give us all eyes to see, and ears to hear, and hearts to receive all the blessings that he has given us. Posted in: Devotional, God's Wonderful World, Life, Simple Joys, Sunday Thoughts. You are welcome, dear friends. Thanks for commenting.